The Capitol Complex, by law, contains the Capitol, Historic Capitol, House Office Building, Senate Office Building, Knott Building, Holland Building and Pepper Building. 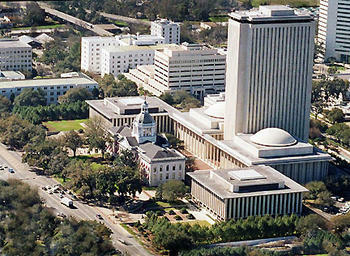 The Capitol Grounds encompasses the same area but excludes the Holland and Pepper buildings. The grounds are bound on the north by Jefferson Street/Pensacola Street, on the east by Monroe Street, on the south by Madison Street and on the west by Duval Street. The Capitol Grounds can be broken into several areas: the Courtyard, House area, Senate area, Historic Capitol, Knott Grounds and Waller Park. On the south side of the courtyard is the Florida Fraternal Order of Police Law Enforcement Memorial. The memorial, dedicated in 2000, has the names of law enforcement officers killed in the line of duty. To the north of the law enforcement memorial is a small dignified memorial in remembrance of Dr. Martin Luther King Jr. The memorial was dedicated in 1984. The Capitol cornerstone is located within its northeast corner. In the center of the courtyard is the Florida Veterans Walk of Honor. Adjacent to the Senate Office Building is a memorial dedicated to Floridians who have received the Purple Heart. East of the House Office Building sits a shade tree dedicated to Andrew Jackson. The Liberty Bell replica sits east of the House Office Building. It was placed in Waller Park in 1950. The replica was a gift to the citizens of Florida as a symbol of the 1950 United States Savings Bonds Independence Drive. It was moved to its current location in 1970. The Florida Sri Chimnoy Peace State Marker is one of many throughout the world dedicated to world peace and harmony. On the lawn of the Old Capitol are two marble obelisks. The southern monument is dedicated to Capt. John Parkhill. Capt. Parkhill led a company of soldiers known as the Leon Volunteers. He was killed at Palm Hammock, Florida, leading his men in chase of members of the Seminole Nation. The other is a Civil War marble obelisk. The monument's legend reads, "To rescue from oblivion and perpetuate in the memory of succeeding generations the heroic patriotism of the men of Leon County who perished in the Civil War of 1861-1865, this monument is raised by their country women." The northeast corner of the Old Capitol holds its cornerstone. Just to the north of the Old Capitol lawn is the Old Capitol Historical Marker. A time capsule sits inside the western steps of the Old Capitol. Within the center entrance to Waller Park is a plaque relating to the man after whom the area is named. The centerpiece of Waller Park is Stormsong, a sculpture of a pod of playful dolphins within the Florida Heritage Fountain. Stormsong was dedicated in 2003.